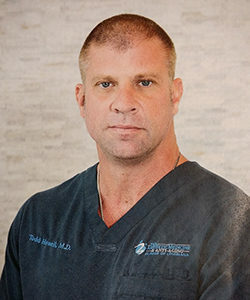 A native of Baton Rouge, Dr. Todd Howell is a vConfidence approved physician who cares deeply about empowering women to improve their feminine quality of life with the absolute highest quality of care and an unsurpassed service approach. Dr. Howell is a member of both the American Academy of Anti-Aging Medicine and the American Academy of Cosmetic Surgery. Dr. Howell specializes in Aesthetic & Anti-Aging Medicine but is also a practicing Emergency Room physician with three years’ experience in general surgery. Dr. Howell graduated from Catholic High School. He attended the University of Texas at Austin, where he received a bachelor’s degree in Biology. After the University of Texas, Dr. Howell attended Louisiana State University School of Medicine at New Orleans, receiving his Doctorate of Medicine. Dr. Howell is dedicated to helping you rejuvenate the way you look and feel, and his very professional, friendly and personable manner makes his patients feel relaxed and he will always take the time to explain the unique issues in your case and answer any questions you may have. Dr. Howell’s excellent bedside manner is complemented by the professionalism, friendliness, and excellent service of the entire staff at the Aesthetic Medicine and Anti-Aging Clinic. We invite you to schedule a complimentary consultation with Dr. Howell, who founded The Aesthetic Medicine and Anti-Aging. Dr. Howell is an expert at performing laser procedures for women's intimate wellness, including the latest cutting edge techniques in vConfidence feminine care, so let our trained staff help you customize a treatment program that is just right for you and your unique needs.